One popular question you have as a homeowner is, “how often should I replace my roof?” Because let’s be honest, these days replacing a roof is far from cheap, therefore it’s important to be prepared. So how often should you replace a roof? According to ASAP Commercial Roofing, commercial roofers in Tyler, TX, when you should replace your roof depends on the type of roof, the condition of the roof, and when it was last replaced, among other things. You could have anywhere between 12 years to 80 years depending on the type of roofing material used. For instance, you should replace shingles every 15 to 30 years, where rubber roofing lasts much longer, between 30 and 50 years. There are some telltale signs that your roof is ready to be replaced, and sometimes they may be ready to be replaced sooner than the recommended time. This is especially true if there has been weather damage, tree damage, or any other type of roof damage. Wet spots on your ceiling, which could mean you have leaks. If the leak is not fixed quickly, it could lead to more severe damage. If your shingles are cupping or curling up, this is another sign it’s time. This could lead to early roof wear and damage because your roof isn’t properly covered. There is visible damage to your roof. If a tree or heavy limb has fallen on your roof, or it has lightning damage or something of that sort, repair the damage if possible. If not, you may need to replace it. The roof looks very worn. Sometimes you can judge by a simple inspection of your roof. If it looks very worn and old, this is an indication it could be time to replace it. Mold on the ceiling, which indicates there is a leak in the roof. The water leaks in and sometimes the only indication that you have a leak is the moldy spot on the ceiling. You are missing multiple shingles. 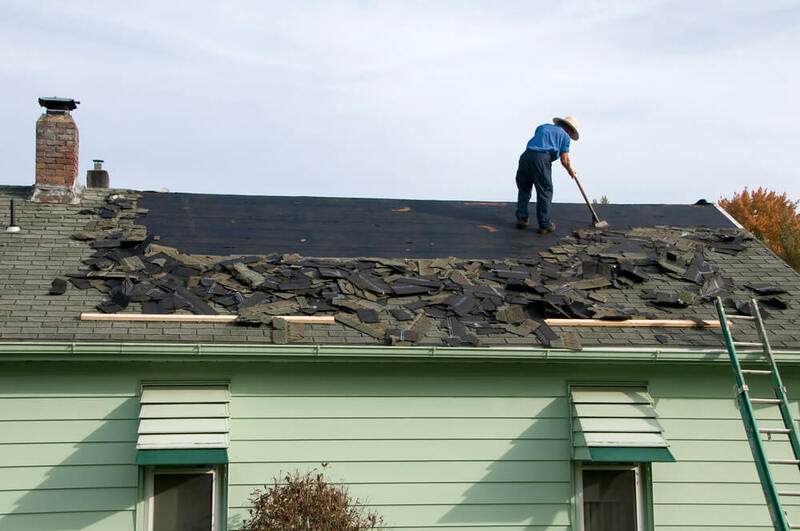 Waiting to replace or repair your roof could bring on more severe damage from water. It is past the required time to replace it. Find out when it was last replaced and go by the recommended time for the type of roof you have. If it’s past time, you should think about replacing it. A droopy, sagging ceiling or roof indicates rot in the wood of your roof. It also means it is time to replace the roof! You may be wondering how long the roof you get will last so you can base your decision off this. The type of roof you choose is purely up to you. Depending on whether you are looking for durability, amazing looks, or a little bit of both, there are different roofing options for you! -Asphalt shingles are one of the most common roofing options. They offer both a lovely appearance and a great price; however, they don’t last as long as some other roofing options. Asphalt shingles could last anywhere between 15 to 30 years. Be sure to regularly check your shingles and perform necessary maintenance on them to ensure you get the longest life out of them. -Metal roofing is becoming more and more popular. It offers a modern look and gives your home awesome coverage and protection from the rain and elements. One main benefit it brings with it is that it lasts a long time. If kept up, it could last up to 80 years without having to be replaced. -Rubber roofing is a less common option. It is extremely durable and, according to SFGate Home Guides, it has excellent UV resistance. This roofing can last anywhere between 40 and 50 years on average. -Wood shake roofing is a wood shingle roofing material. It happens to be extremely durable and easy to manage. If taken care of, it can last between 20-40 years! If you have already purchased your home, find out when the roof was last replaced and be sure to perform roof inspections twice a year to make sure that no unforeseen problems arise. When you will need to replace your roof depends on what roofing material was used, along with many other factors. If there is roof damage or a leak in the roof, this does not mean you have to replace it. You can most likely perform small repairs in order to avoid having to replace the roof before its time. The cost of a roof replacement is an extremely important factor to consider. Before making that decision, be sure that you are financially capable of finishing the job. The price of a roof replacement varies depending on type of roof, how many square feet your roof is, and the prices of material in your area. Asphalt roofing: For a 2,000 sq. ft roof, it will cost you any where between $7,000-$10,000. Metal roofing: This is a little pricier at anywhere between $11,000 to $14,000 according to Angie's List. In the end, it’s worth it though. The metal roof reflects the sun, leaving a cooler temperature inside the house which saves you money on electricity. Rubber roofing: Typically costs anywhere between $8,000 and $16,000 for a 2,000 square foot roof. It is extremely durable, so it pays for itself in the end. Wood shake roofing: This option will cost you anywhere from $10,000 to $27,000, according to HomeAdvisor. Know your options when deciding to replace your roof and choosing a roofing material. Research the pros and cons of each option to figure out which the best one is for you.